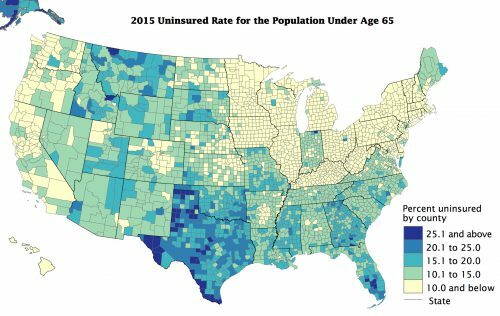 Texas continues to drag behind the rest of the country when it comes to health coverage, with a 16.6% uninsured rate, compared to 8.8% nationwide (U.S. Census Bureau). 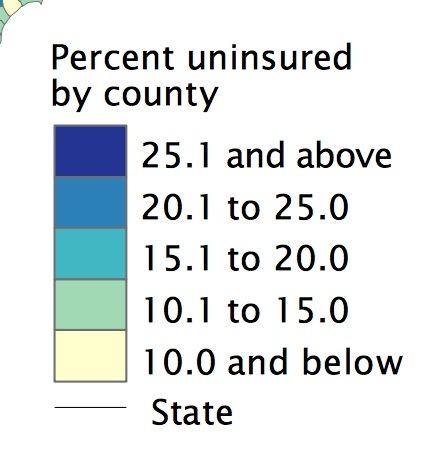 Within the state, counties along the border are where you see the highest uninsured rates. As the December 15th Affordable Care Act enrollment deadline approaches, navigators scramble to help people find an affordable plan. Despite their efforts (and improving uninsured rates) there are still many barriers keeping Texans – especially along the border – from finding affordable coverage. Health care professionals like Sarah Vasquez have spent months preparing for the open-enrollment period. “We try to advertise in English and Spanish, we try radio spots, we do outreach and letting everybody know when open enrollment is,” says Vasquez. Vasquez works for Preventative Care Health Services in Alpine, Texas as a marketplace navigator or “assister”. Together with colleagues in Marfa and Presidio, Vasquez helps people apply for health insurance. It’s also her responsibility to spread the word about changes to this year’s enrollment period. Massive cuts to outreach spending have trickled down to small clinics like where Vasquez works. “There have been some cuts – in this organization we managed to get word out,” she says. Vasquez is also working against the clock. The enrollment period is half the length it was last year. Vasquez says though she’s kept busy in Alpine, her coworker in the border town of Presidio has seen the most applications. 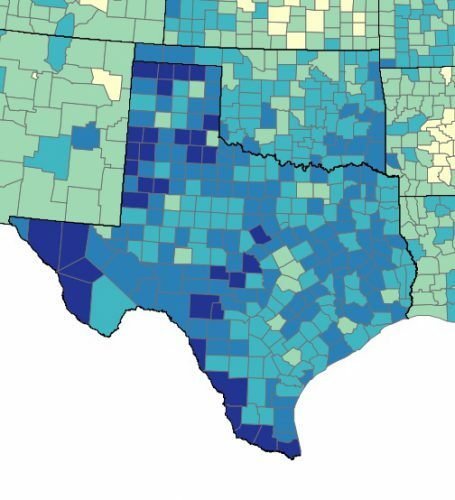 Border communities in Texas are among the least-insured areas in the country, many with uninsured rates over 25%. And that’s not by accident, says Anne Dunkelberg, Associate Director of the left-leaning Center for Public Policy Priorities. Dunkelberg says border counties are poorer, which means less people can afford health insurance. Gilberto Rodriguez has been serving up Mexican food at the El Patio Restaurant in Presidio for 18 years. Rodriguez says he doesn’t buy coverage because it’s too pricey. Like many Presidio residents, he crosses the border into Mexico when he’s sick or needs medication in order to get affordable care. “Not even with Obamacare can working people like myself afford health insurance,” Rodriguez says in Spanish. U.S. Census data shows Presidio’s median household income is $25,668 – less than half of the statewide median of $54,727. Meanwhile, some 15% of Presidio households earn less than $10,000 per year. That causes problems for low-income Texans seeking insurance, since enrolling in the ACA marketplace requires a minimum yearly income of $12,000 to qualify for federal subsidies. And though some low-income adults are covered through Medicaid, many are not. Many of Texas’ working poor do not meet the requirements to receive Medicaid, like having a serious disability or being a senior citizen in poverty. “The absence of any kind of public coverage for most of our working poor in Texas is a big big contributor to why we have the worst uninsured rate in the United States,” Dunkelberg says. ACA Medicaid expansion was intended to fill in some of this coverage gap – people who weren’t qualifying for Medicaid, but didn’t reach the $12,000 minimum income requirement for federal subsidies in the marketplace. After the Supreme Court decided states had the right to not implement the Medicaid expansion, Texas and 17 other states still haven’t opted in. Republican lawmakers in Texas argue that health insurance isn’t the same as healthcare and that there are more economical alternatives to public coverage. “I’ve also told House Leadership I will continue to champion funding for Community Health Centers and increased reimbursements for rural providers,” U.S. Rep. Will Hurd said in a statement responding to the overhaul of the Affordable Care Act earlier this year. Alternatives to public coverage include Federally Qualified Health Centers or FQHCs, which offer primary and preventative care in underserved communities and receive grants from the U.S. Department of Health and Human Services. These centers offer health services at a sliding scale fee based on income. 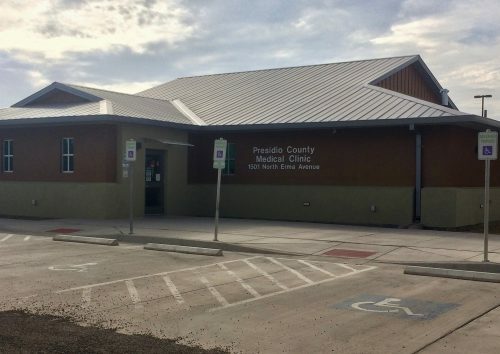 There are currently three of these clinics in far West Texas. Nurse practitioner Bob Rice treats both insured and uninsured patients at the Preventative Care Health Services practice in Presidio. As a certified FQHC, a low-income patient can pay as little as $15 for a doctor’s visit. Though the clinic offers options for the uninsured, Rice says he suspects expanding Medicaid would benefit the community. “I think if Texas would expand Medicaid, more patients that would be able to afford health care,” says Rice.